it is a rainy Memorial Day Weekend here in Manhattan, Kansas. 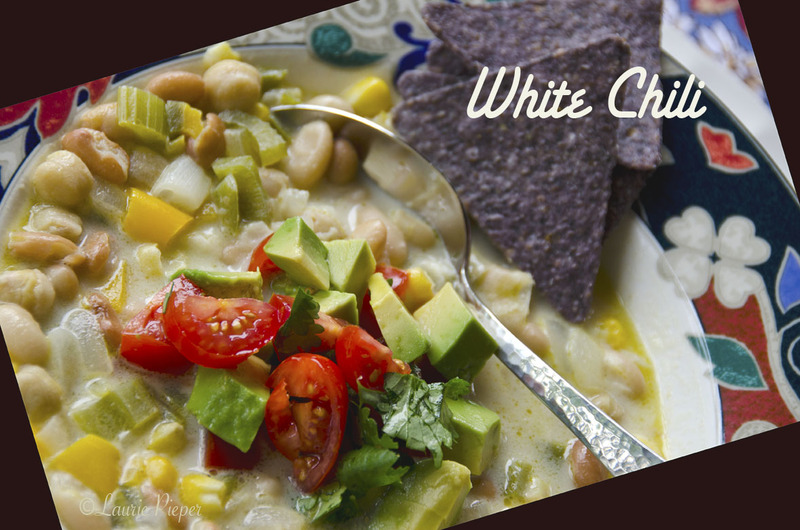 So I thought that a White Chili would be a good dish to serve – fun & casual, flavorful & warming, but not too heavy. I hope that you are having a great weekend! 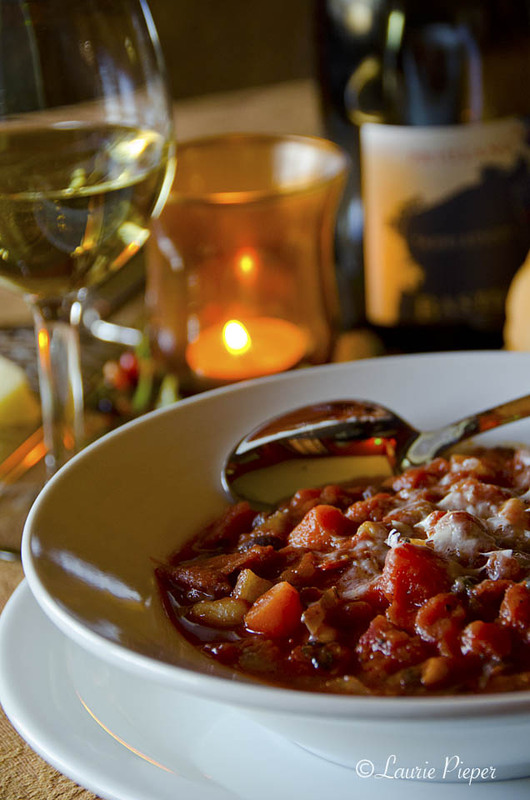 This flavorful dish is what is traditionally referred to as a white chili (because no tomatoes are used in the base). This vegetarian version, though, is more of a light golden color. Place olive oil in a large deep skillet or stock pot over medium heat. Add garlic, onion, celery, and peppers. 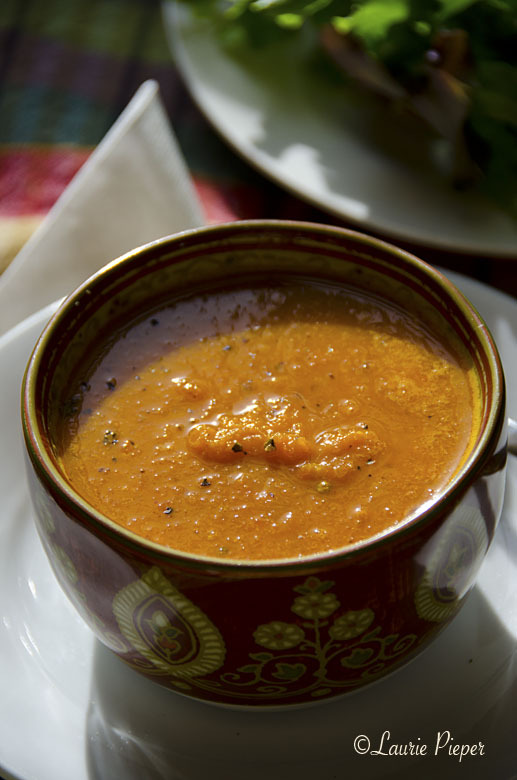 Cook for a few minutes, stirring frequently, until vegetables are crisp-tender. Stir in chick peas, beans, corn, cumin and white pepper. Meanwhile, dissolve bouillon cubes in boiling water. Add cream cheese to bouillon and stir until mostly dissolved. Stir bouillon mixture into pot. Reduce heat to medium-low. Cook just below a simmer for 20 – 30 minutes, stirring frequently. Just before serving, toss together avocado, lemon juice tomato and cilantro leaves. Ladle chili into bowls. If desired, top with cheese. Garnish with avocado-tomato mixture. Enjoy! Happy Memorial Day Weekend! This is a simple dish to make – done in the amount of time that it takes to cook a box of spaghetti – but it has a delicious combination of flavors and is very rich and satisfying. Add olive oil, wine, onion, garlic, a couple of dashes of salt and a couple of dashes of red pepper flakes to a large, deep skillet (about 12 x 3”.) Place on burner over medium heat. Stir ingredients. Cook for about 1 – 2 minutes. Drain the pasta when it is not quite done. Add nearly cooked pasta to skillet. Toss with olive oil mixture several times. Cook for about 1 minute. Add spinach. Toss with pasta several times. Cook for about 1 minute. Add cheese. Toss. Check pasta for doneness. 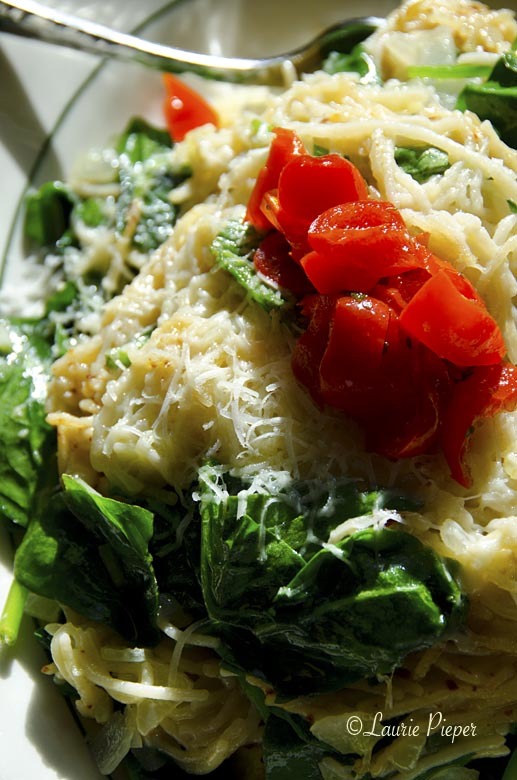 When pasta is the desired doneness, transfer to a serving platter or to individual dishes. Garnish with chopped peppadews. Serve immediately. * I served the pasta with Feudi di San Gregorio Falanghina and so used that in the dish. I love to experiment with sauces and flavors, but sometimes they can get in the way of one’s appreciation of the main element of a dish. 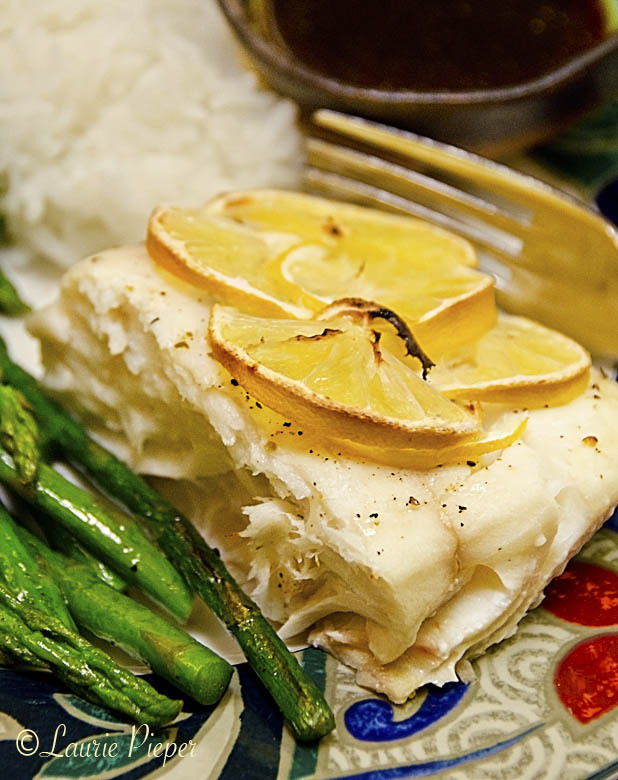 So whenever I have a really great piece of fish – like this halibut that a friend sent to us from Alaska – I like to keep its preparation simple. That way the fish itself can really shine. Here I served the Baked Halibut with stir fried asparagus, steamed rice and soy sauce mixed with lemon juice and a dash of cayenne pepper served on the side. 1. Preheat oven to 350 degrees F. Place a piece of parchment paper on a baking sheet. 3. Place fish in oven and bake for about 30 minutes or until cooked all of the way through. (The fish will be solid white in the center, not somewhat translucent.) Serve immediately. • Mix a few thin slices of red onion in with the lemon slices. • Drizzle just a little bit of melted butter or olive oil on the fish before baking. • Top with a little bit of chopped fresh parsley when serving.